"Seventy-seven acres of barren, mosquito-infested land were transformed into a great and successful experiment in urban housing design…" is how the AIA Guide to NYC describes Sunnyside Gardens. Inspired by the English Garden City movement, this group effort in Queens by architects, landscapers, and real estate developers (as well as architecture critic Lewis Mumford, who lived there for over a decade) was built between 1924 and 1928. Today, the Historic District is 17 blocks and all of the buildings have adjacent garden spaces, in addition to Sunnyside Gardens Park. (The Park is private, but open to all residents for a fee and some volunteer time). 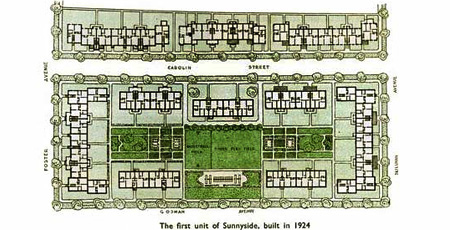 From A. Richard Miller's site Sunnyside and Sunnyside Gardens, you can get a lot of additional info and see things like floor plans of the Phipps Garden Apartments (built in 1931). The Sunnyside Gardens Preservation Alliance is important for anyone interested in the preservation of this special place. 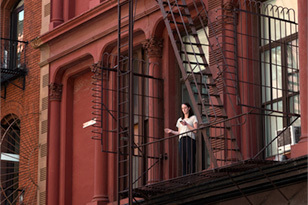 The area was landmarked [PDF] in 2007. Find local news at Sunnyside Post and We Heart Sunnyside.